Knights of Nature Junior Camp” is a specially designed camp for young students between the ages of 10 and 12. Although the Knights of Nature Sustainability Camp had already been established, Knights of Nature Junior Camp was the first camp designed for students as young as 11. 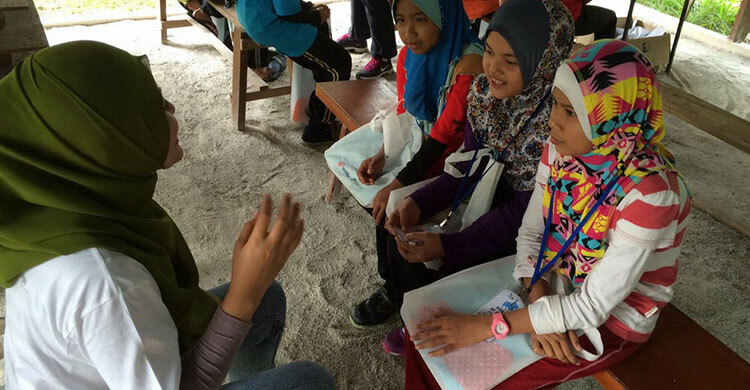 This camp was funded by the CIMB Foundation and the young beneficiaries are from Khazanah Nasional Berhad’s Yayasan Pintar program. 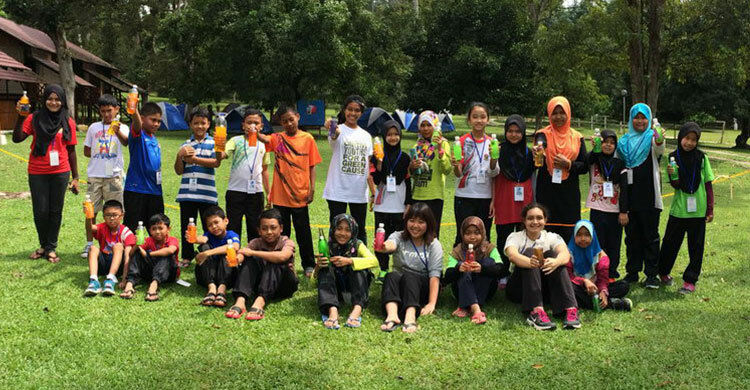 In this camp, there were twenty 11 year olds involved as participants from ten schools in Kedah and Perlis. Ten teachers also accompanied the students. 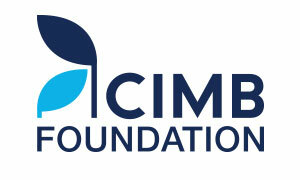 The camp was the result of collaboration between CIMB Foundation and EcoKnights. 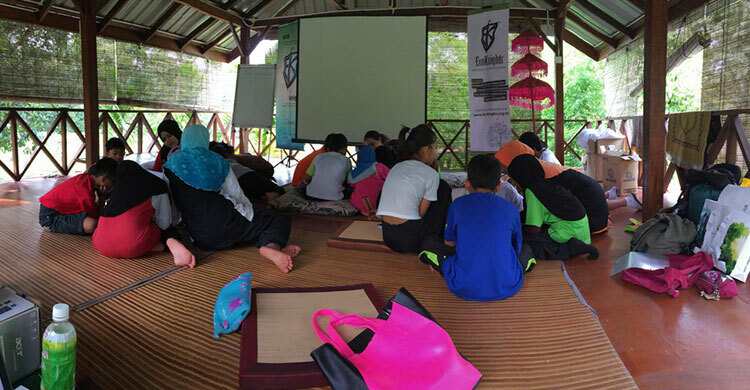 The main goal of the camp was to provide educational exposure to the ten teachers and twenty students about the impacts of plastic, plastic pollution and recycling. The first day of the camp began on the morning of Monday, the 8th of June. After a brief registration, thus began the 3 day /2 night camp. Like any other camp, it opens with ice-breaking session where the participants had to introduce themselves to their changing partners after every 30 seconds. The owner itself, Pak Din, also gave the students a tour of the farm. Afterwards, the camp proceeds to hold the 1st activity led by President of EcoKnights, Yasmin Rasyid. In this session called “Our Planet”, Yasmin explained to the participants of our solar system, the importance and significance of planet Earth and the needs of humans on the planet. The participants also had the chance to illustrate their own planet. This time, they created their own planet with recyclables materials. 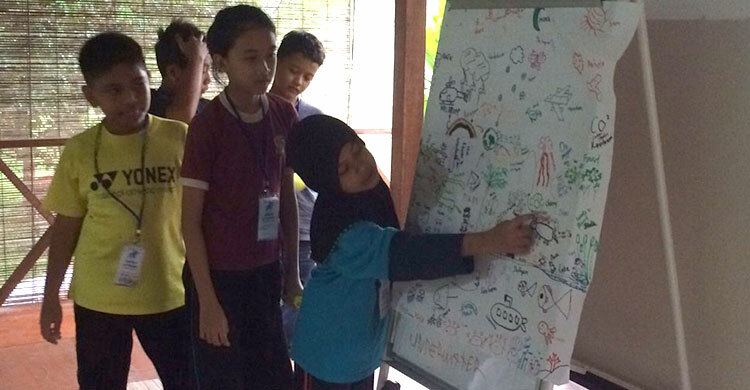 After a brief break-time for lunch, Program Director of EcoKnights, Fadly Bakhtiar took over for a session called “How do you tell your friends about the ecology of the Planet?” For this session, the camp participants were asked to draw anything that came to their mind when they heard the word “Ecology”. After 30-minutes, the participants were asked to arrange their drawings according to certain levels; “Underwater”, “Land”, “Sky” and “Outer space”. From these drawings, the students would later present of their finding on what “Ecology” is. This session’s main goal was to encourage the students to have more confidence in speaking in English. After this session, the participants were given free time for outdoor games, rest and prayer time. At 7.30 p.m., after a dinner, there was a film screening arranged for the students. To end of the evening, “Wall- E” a Pixar animated movie was played for the participants to convey the effects of mankind’s complacency in ensuring the sustainability of the environment. Day two of the camp was kicked off by Pak Din and his pony, Queen Mary, at the riding ranch where the kids were given the opportunity to ride the youngest stallion on the farm. Following which, the participants were then assembled indoors where one of our EcoKnights intern, Nia, presented on the pressing issues of over-consumption and the need to reuse, reduce and recycle for the sake of the environment in short, “Trash Talk”. A number of team building activities were included in this session where the participants were required to discuss and present as a group the ways to reduce trash both at home and at school. They demonstrated great enthusiasm and creativity in their explanations on their understandings of overconsumption and the 3Rs. In addition to this, they were also taught several different but easier ways to reuse their trash. “Jellyfish in a bottle” was one of the activities where the participants were required to reuse water bottles, food colouring and plastic bags to make their very own jellyfish in a bottle. The participants displayed great enthusiasm, support and were well engaged throughout the course of this session. This was then followed by another activity which revolved around the idea of reusing food waste where the participants, again operated as a group to create their very own home-made play-dough out of expired food items which are usually available at home. The aim of this activity was to promote confidence in communicating with each other, build teamwork and most importantly, convey to the participants how they can have fun and save the world at the same time with the items that they can find around their homes. The participants co-operated well with counsellor, Cheah, who was the leader of this activity. Their creativity in moulding and conjuring their views of the environment via the home-made playdough was evident when each group presented different designs and colours of animals, trees and rocks followed by interesting explanations which left the crowd engaged and inspired throughout the activity. Although the wholesome ideas of the camp were to build confidence among the participants to communicate better in the English medium but as the activities were carried out, these aims were expanded to explore their abilities to understand a subject matter and convey it in a creative form. Simple to say, the participants were exposed to a platform where being creative was not a crime. This was further fostered by Anna’s activity which was titled “Tune up the Earth” where the students were required to work together, not in separate groups, but collectively this time to draw up a world that is “tuned” in a way that practices the 3Rs and is aware of the importance to grasp the English language. The participants were able to display their understanding of what was required from this activity and they also inserted a few humorous messages in their work of art by dividing the paper into sections where there were drawings of the 3Rs being practiced coupled by drawings of institutions where only the English language was permitted as a form of communication. It can be said that the participants were well engaged and had a lot of fun doing these activities although they were required to stay indoors the whole time. After lunch, the participants were finally allowed to explore the outdoors where they were divided back into their respective groups and were required to go on a scavenger hunt to collect items which consisted of a mix of trash and recyclables. They were required to complete a series of riddles in line with recycling before they were allowed to venture outdoors. They displayed great teamwork and enthusiasm during this activity which was carried out by one of EcoKnights interns, Samira. These young and vibrant participants were all over the compound looking under every rock and over every possible branch to locate the items to be separated according to the respective recycling bins afterwards. This activity was aimed to put their practical understanding of the practice of recycling to the test. Each group displayed great understanding as they segregated their trash and recyclable items correctly into the given bins. Safe to say, we now have potential Junior EcoKnights as our legacy for the future. The evening was packed with the sound of laughter mixed with bits of frustration as the air in Ulu Hati camp was filled with water balloons being thrown from one side of the net to the other. This is the signature Ulu Hati game, known as the water balloon volleyball, which has to be played by all camp goers. It was joined by the Super Crew (camp counsellors) which made the game even more interesting and challenging. Teams were created and balloons were flung with the help of towels from one end of the field to the other. This game promoted team building and strategy but nevertheless it did not lack the element of fun which was a fine ending to the action packed evening of day 2 of the camp. Followed by this, the participants then proceeded to the pool where they indulged themselves in the cool water splashing away at each other before hitting the showers. This night was then wrapped up by a hearty dinner and the screening of “The Lorax” to encapsulate the message of the day which was the importance of protecting the environment. The third sunrise at Ulu Hati camp was followed by another horse riding session conducted by Pak Din) and his lovely pony Queen Mary where the participants based on Pak Din’s review had improved greatly as they were more confident in riding the majestic stallion as compared to day one of their experience. After breakfast, the participants were joined by Fadly Bakhtiar where he conducted the last session for the camp where the participants were required to discuss in their groups the experiences that they’ve obtained throughout the 3 days 2 nights venture, the people they’ve met and what they had learnt. Each group took about 30 to 45 minutes to draw out their experience in a big sheet of mah-jong paper. This activity was aimed to consolidate their experience and at the same time to enable the participants to describe what they had learnt without the use of any words. This is to encourage the participants to be more familiar and boost their creativity in the medium of expression via pictorial illustrations. Each group during their presentation displayed great improvements in their confidence and communication as they were no longer shy or timid while presenting, instead they were bolder and more confident to speak up during this session to the extent of posing questions to each other during the Q & A sessions of the presentation which made it even livelier. 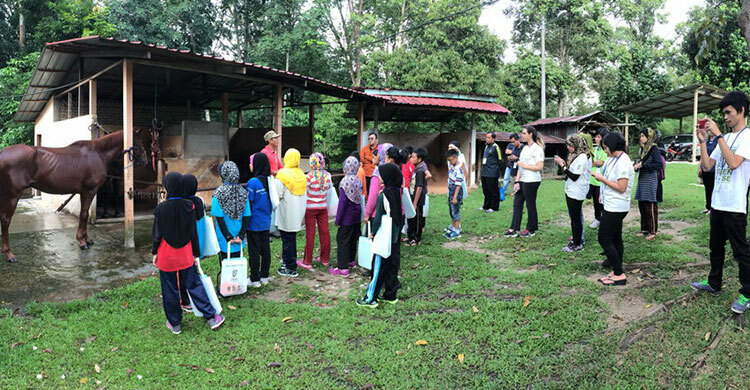 This was then followed by a lunch break and the presentation of certificates to the participants and teachers by the CIMB Foundation group upon which the participants packed up their belongings and headed their way to KLCC marking the end of the Junior Camp 2015. This camp can be said to have provided the participants with a wholesome experience by not just enabling them to be more comfortable in expressing and communicating in English but also pushing them to activate and further develop their creativity in expressing without the help of words. This camp was an important milestone to EcoKnights because; we were able to spread awareness to the younger generation, which is one of the most valuable assets in ensuring the sustainability of our environment in the future. In addition to that, it also benefitted the participants as it provided them with a brand new opportunity of meeting and interacting not just with people of their own values and culture but also people with different set of values and understanding of the world. We hope that this experience had opened up the hearts and minds of the younger generation about the need to ensure sustainability and the need to practice the 3Rs no matter where they go.